After relaxing in the lobby, you will finally be shown to the guestroom. A female attendant known as Nakai-san will, with your prior consent, carry your personal luggage. On the way to your guestroom, the Nakai-san will give you a quick tour of the ryokan. The custom in Japan is to take off one's shoes indoors. As for ryokans, some request guests to take off their shoes and wear slippers at the entrance, while others allow guests to keep their shoes on as far as the guestrooms. At ryokans where the guests can keep their shoes on as far as the guestrooms, the corridors are either stone-paved or carpeted. 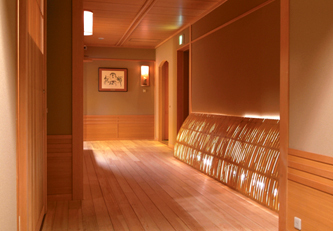 In contrast, at ryokans where the guests are requested to remove their shoes and wear slippers instead, the corridors usually have wooden flooring. Moreover, at some ryokans the corridors are tatami-matted, in which case the guests are to walk along without shoes or slippers.